And a thing called Love! Get out the egg nog and deck the halls because the holiday season is here! All is jolly and bright even if you're waking up at 4 am to start shopping because here comes Santa Claus with a new Popper wrapped in Holiday Cheer! 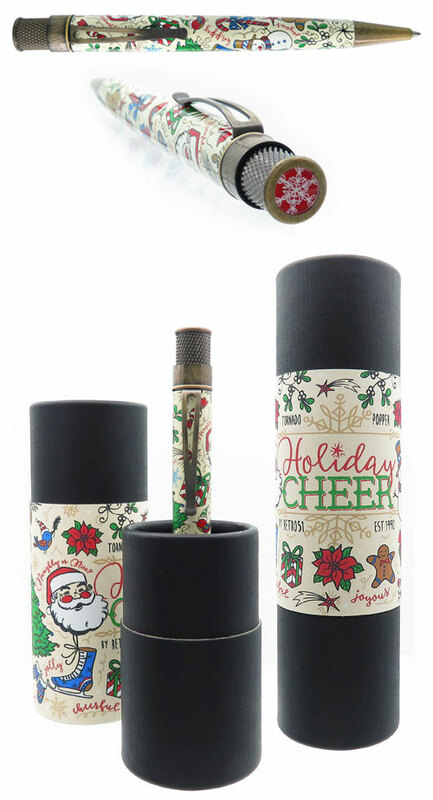 Jolly ol' St. Nick, Frosty, poinsettias, mistletoe and other merry graphics cover this Tornado rollerball complete with antique brass accents, engraved limited edition number and graphic top disc. Each one is cheerfully packaged in a matching tube and ready for gift wrapping. Pick one up today to write your holiday list and letters because it's time to spread the cheer! When danger strikes, it is natural to run but fire fighters don�t, instead they run into the fire. Courage, sacrifice and honor describe these heroes and Engine 37 honors them in the latest Tornado Popper. This twist-top rollerball is decorated with the Maltese Cross, diamond plated texture, shiny chrome accents and graphic top disc. Pick one up for the hero in your life, or for yourself as a reminder to put service before self. 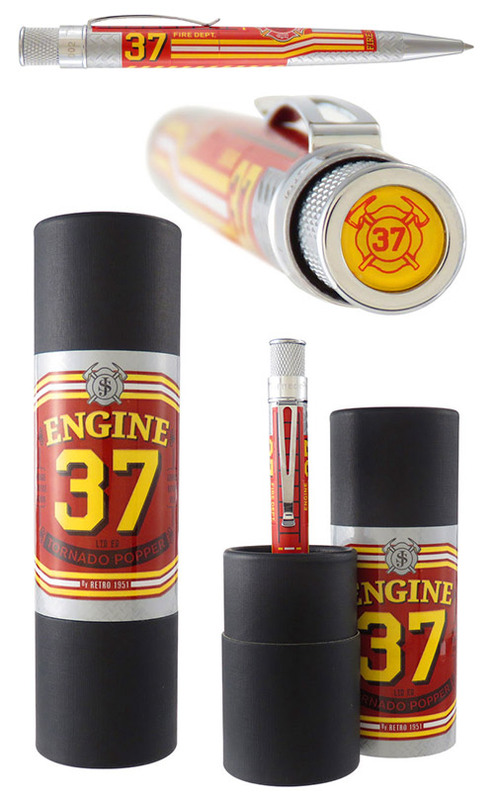 Engine 37 is limited to 937 pieces with each top ring numbered and then packaged in a commemorative tube. Finish: Fire Engine - SORRY SOLD OUT IN 24 HOURS!! The Tornado collection from Retro 51 has become a modern day pen collector�s classic. 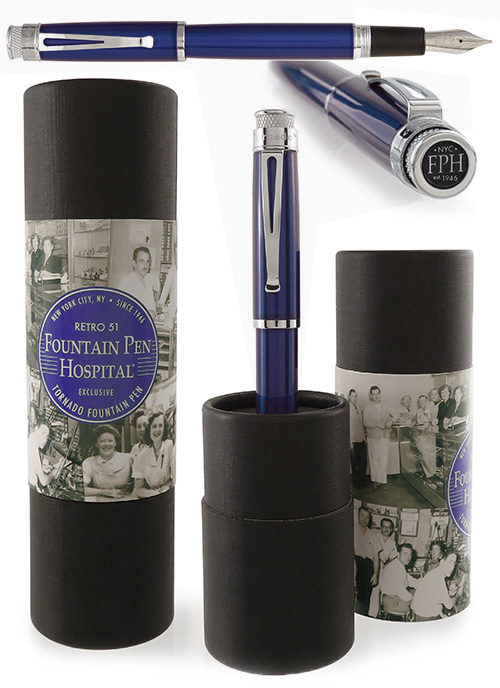 The FPH-exclusive Retro 51 TRUE BLUE Limited Edition Fountain Pen is a smooth-writing tribute to Fountain Pen Hospital and its enduring spirit. True Blue is more than our corporate color....it's the way we are... the way we've always striven to be�for over 70 years! And this affordable, gleaming blue lacquer daily writer shines in every way! Starting with a solid brass barrel, the pen is then coated with just the right amount of lacquer to give the unique iridescence Retro�s are noted for. The top disc has been customized exclusively for F.P.H. and the top ring is engraved with an individual serial number, making each pen unique from all others. The oversized Schmidt iridium nib (choose F, M or B) is designed to be smooth and reliable, perfect for an everyday writer. Fills with standard international cartridge or converter (included). The custom designed tube features images of our family owned store and some of the wonderful people that have helped us remain a New York institution since 1946! The Tornado collection from Retro 51 has become a modern day pen collector�s classic. We are excited to present this F.P.H. exclusive; a specially numbered edition Tornado lacquer fountain pen in vibrant Deep Purple! Starting with a solid brass barrel, the pen is then coated with just the right amount of lacquer to give the unique iridescence Retro�s are noted for. The top disc has been customized exclusively for F.P.H. and the top ring is engraved with an individual serial number, making each pen unique from all others. The oversized Schmidt iridium nib (choose F, M or B) is designed to be smooth and reliable, perfect for an everyday writer. Fills with standard international cartridge or converter (included). The custom designed tube features images of our family owned store and some of the wonderful people that have helped us remain a New York institution since 1946! With the basketball season intensifying in college and NBA, who will be the all-star to take their team to the championship? This Big Shot rollerball has an acid-etched texture with hand applied red, white and blue lacquer complete with black gloss trim. Each pen has been numbered on the top ring and comes in a matching tube with only 951 pieces produced. Edition: 730 Pens-Sorry! Sold out pre-release! According to historians, blue and white earthenware originated as early as the seventh century during the Tang Dynasty and became broadly popular in the 13th century during the Yuan Dynasty. By the 14th century it was mass produced and traded throughout the Eastern world and continues to be popular to this day. The latest Tornado Popper Dynasty is printed with a dragon, phoenix and floral motif inspired by these historical artifacts. They are finished with stonewashed pewter accents and complete with the Chinese symbol representing �fortune� imprinted on the top disc. Each rollerball pen has been numbered on the top ring and packaged in a commemorative tube with only 888 pieces produced. Make sure to get one for your collection before they become history themselves! Holiday music is playing, we know you�re listening. Writing your Christmas list & this new Popper is glistening. Oh what a beautiful sight, you�re happy and bright, because you�re writing with a Winter Wonderland. The new Tornado Popper is here just in time for the holiday season. The barrel is coated in a glittering white finish that�s been printed with a bustling snow village. It is complete with chrome accents, numbered top ring and matching tube packaging. 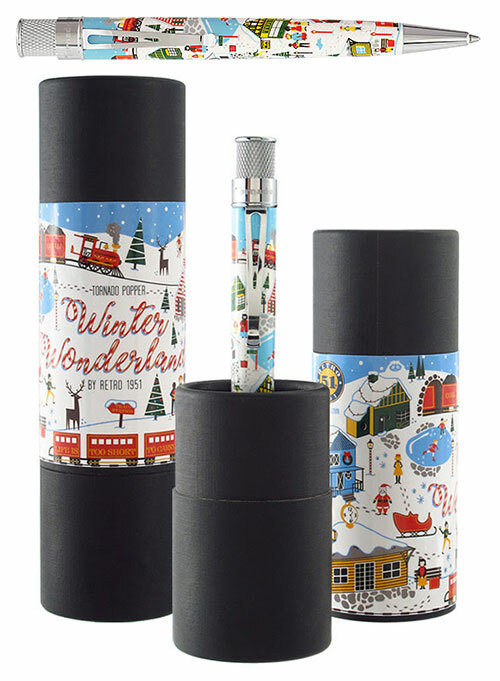 Only 934 have been made so get yours today, so you can be writing with a Winter Wonderland. Retro 51's latest Limited Edition 'Zodiac' Popper Tornado is decorated with all twelve western zodiac signs, including glow in the dark stars and trimmed with matte black nickel accents. The stealth style smooth writer can be utilized for several tasks, but more importantly, it will be a catalyst to capture your dreams. 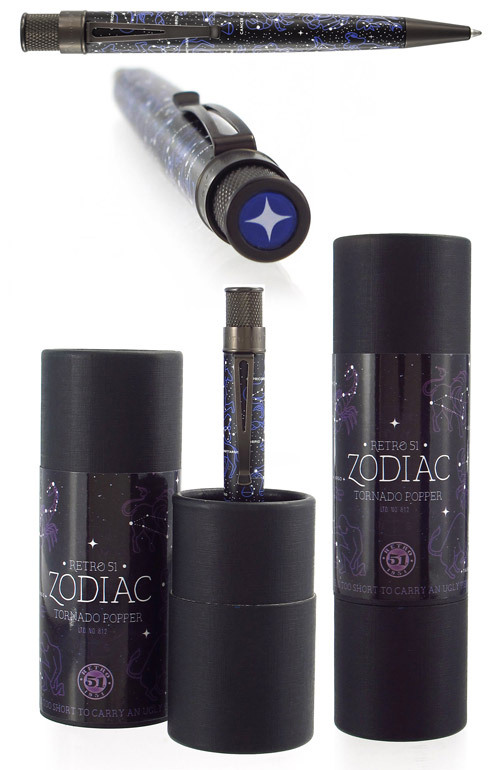 Each Zodiac Popper comes packaged in a matching tube and is numbered on the pen's top ring. Limited to only 812 pieces. 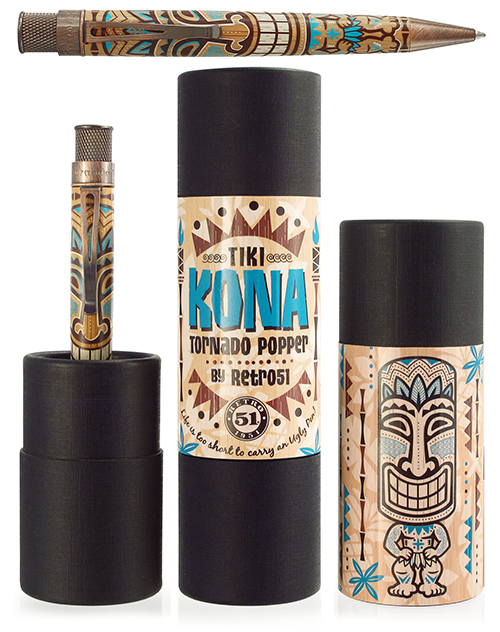 Say �Aloha� to your new favorite Retro... Tiki Kona! He loves walks on the beach, mai tais, crab rangoon and listening to island music with friends. Pick up this festive Tornado Popper and you�ll feel the fun vibes. The bamboo barrel has been printed with tiki graphics and accented with antique copper trim. It�s finished with numbered top ring, decorative top disc and packaged in a commemorative tube. Kona is a limited edition with only 938 pieces produced, so get one before his ship sails to the next island. There is nothing better than a summer night at the ballpark with a cold drink and a hot dog while watching America�s pasttime. This Tornado Popper is printed with baseball terms and sayings that will take you back to your Little League days. It is complete with chrome trim, numbered top ring and baseball imprinted top disc. This series is limited to 842 twist-top rollerballs in honor of (#42) Jackie Robinson�s 70th anniversary of playing his first MLB season. You can�t strike out with this design! Only 758 pens are available, so get one before it costs you an arm and a leg. Great white sharks have terrified us for years! From the release of JAWS in 1975 to 29 years of TV*s Shark Week, we cannot get enough of these predatory fish. With this mystique in mind Retro 51 created the latest Tornado Popper, *Shark Alley*. 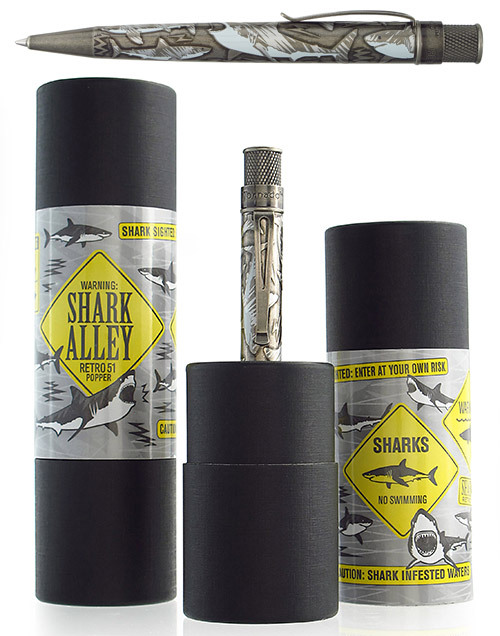 The barrel is swimming with several acid-etched sharks, plated in a stonewashed pewter finish and complete with accent printing and gloss varnish; packaged in a matching tube. This retractable rollerball has a twist-top mechanism and gives you smooth-flowing rollerball ink or switch it to a ball pen with a refill change. In homage to Soccer, Retro51 has created *Breakaway*, a twist-top rollerball with an iconic hexagon pattern acid-etched into the barrel, with matte white finish and black hex print. It is complete with a soccer ball on the top disc, numbered top ring and packaged in a commemorative tube. Numbered Limited Edition of 2,500 pieces worldwide. It�s beginning to look a lot like Christmas! Lights are starting to shimmer at night and the sweet sound of carols fill the room. Retro 51 loves the holiday season and designed this special Popper in the spirit of the most wonderful time of the year! *Twinkle* is a unique Popper with an aluminum barrel, diamond cut to reveal several stars that reflect the light in a most elegant way. It is finished with rose gold accents that have been numbered on the top ring and packaged in a matching tube. 1,225 total pieces available in this numbered edition. Spring is here and baseball season is in full swing! So grab your baseball cap and Retro 51*s latest Big Shot Tornado Popper, Homerun. This baseball edition commemorates America*s Favorite Pastime with a baseball design limited to 750 numbered pieces complete with special packaging. 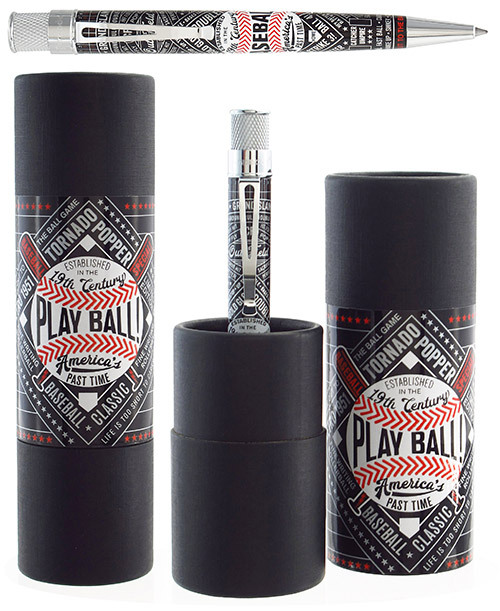 Each Homerun rollerball has acid etched baseball threads, then is lacquered in an antique white and printed with red on the threads. It is complete with antique brass accents and a baseball within the top disc. It is the major leagues of writing instruments! The Big Shot design is thicker than the standard Tornado, with a diameter of just over 1/2 inch at its widest point. There's nothing like a game of pinball to remind you of good times at the arcades. The feel of launching the pinball, the music of accruing points, scoring the double bonus and flipping it back up the board for more! With this fun in mind, Retro 51 created the Flipper Tornado Popper filled with classic pinball graphics and finished with antique silver accents. Pick one up and feel the rush of throwing this twist action rollerball into play. This retractable rollerball has a twist-top mechanism and gives you smooth-flowing rollerball ink or switch it to a ballpoint pen with a refill change. 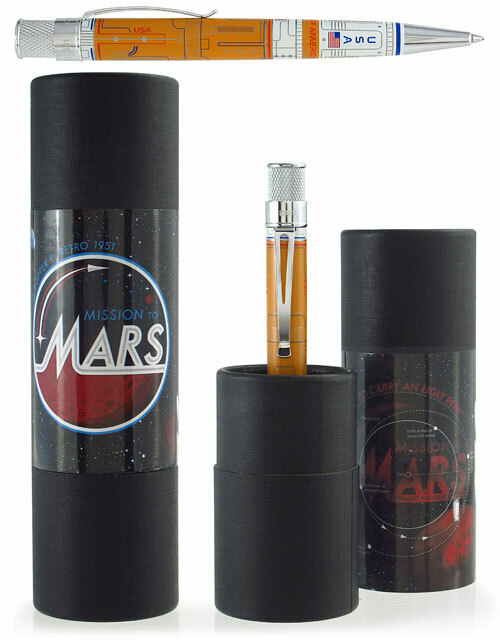 Limited to 750 numbered pieces packaged in a graphic tube, while supplies last. Zag is a full Glow in the Dark Tornado Convertible rollerball/ball pen, limited to 500 pens worldwide. Retro 51 Popper-Zap Tornado Deluxe Special Edition Glow in the Dark Ballpoint Pen/Rollerball - Capturing your brilliant ideas throughout the night, this glow in the dark Special Edition Popper-Zap Tornado Deluxe is sized slightly larger than the Classic Tornado. Made of stainless steel with a glow-in-the-dark geometric pattern, this twist-top rollerball can be converted to a ball pen with a refill change. 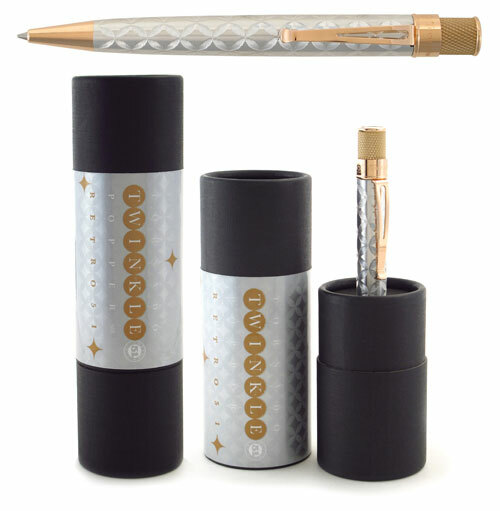 Try the Tornado Deluxe � the everyday writing instrument that is far from ordinary! In honor of its 20th anniversary, Retro 1951 is proud to present this Limited Edition Tornado to commemorate two decades of blood, sweat, tears and ink. LOTS of ink! Only 1951 individually numbered pieces are available worldwide. Each pen has a copper-plated barrel with rose gold accents and is packaged in a special commemorative gift box. The barrel is unique in that it has not been covered in the usual protective coating. The exposed copper will age gracefully to a handsome patina while allowing you to take full advantage of the positive anti-microbial effects that are the hallmark of genuine copper. 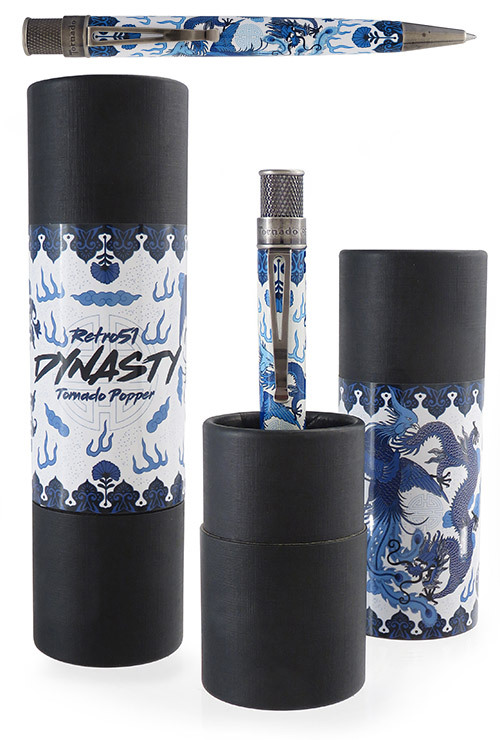 Retro 51 presents the third design in its series of hand-painted, limited edition Tornado rollerballs, the Long Bi Dragon. A symbol of power, valor and perseverance, the dragon design is hand-lacquered by skilled artisans using many layers of natural lacquers and gold and silver powders. It takes four months to complete the artistry of each golden dragon. Limited to 518 numbered pieces, the Long Bi capless rollerball is trimmed in rose gold accents and presented in a lacquered wood box. 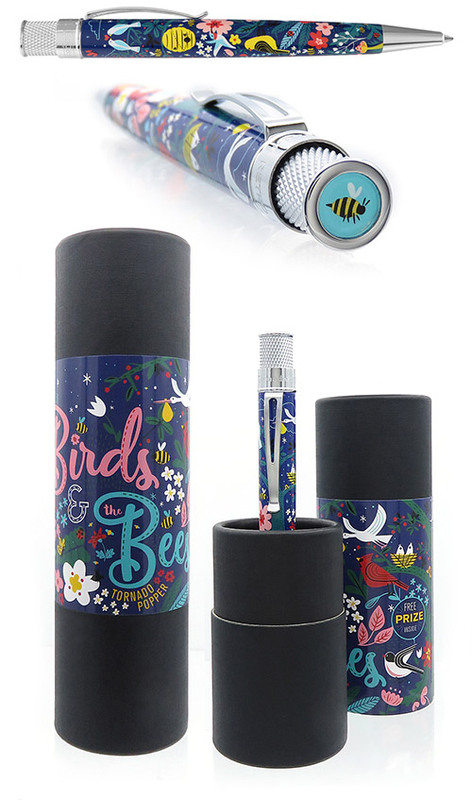 With the success of last year�s Cherry Blossom limited edition rollerball, Retro 51 now presents the artful, hand-painted Pou Koi. Central to Asian culture for thousands of years, the art of hand lacquering requires skilled artisans to apply layers of tinted lacquers and genuine gold and silver powders to create functional works of art. It takes four months to complete the tranquil Koi fish design. Shades of vibrant red and gold contrast with the glossy black lacquer depicting a scene from nature that must be seen to be truly appreciated. Limited to 518 pieces worldwide, the capless rollerball is trimmed with premium rhodium accents and presented in a traditional lacquered wood box befitting this rare collectible pen. Each pen takes four months to add the many layers of lacquer required to complete the cherry blossom design.